Greshams School has a large campus surrounded by woods and playing fields outside Holt in Norfolk. The practice designed a new Sixth Form Centre on the edge of a projecting area of trees, close to the Chapel, theatre and music school. The building faces the playing fields, with a landscaped area to the south creating a ‘public space’ connecting back to the main school. The entrance to the new building is aligned with a new route past the chapel. The Building contains a lecture room for 150 with a double height café, which can be combined as one space if required, to allow discussions with the whole sixth form. The lecture room has a green room for performances, and folding bleacher seating for multi use. A central ‘spine’ corridor runs the length of the building, providing access to service areas, admin, 7 classrooms and an open plan library and seminar rooms. The building form uses a double pitched roof either side of the central corridor, with the café and lecture room locked into the south east corner facing the school and fine mature beech trees. 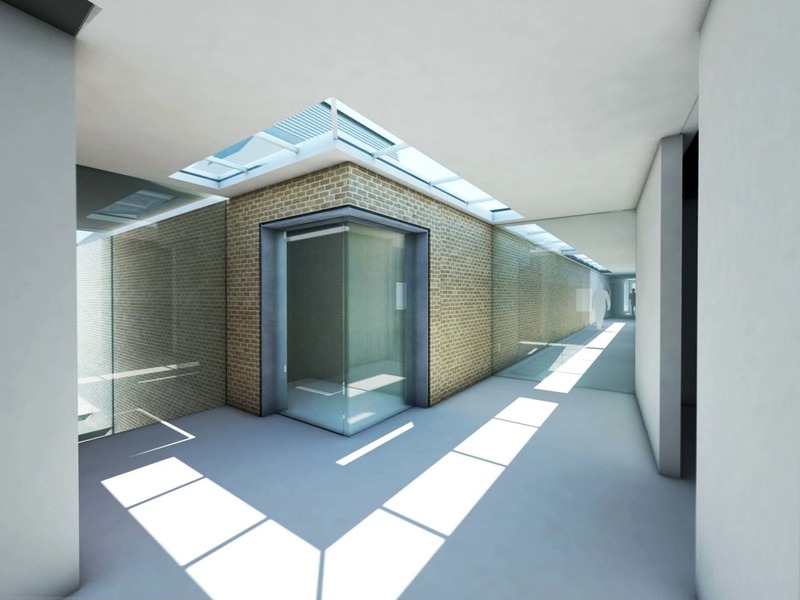 The elevations are intended as a contemporary interpretation of the traditional school buildings, using deep reveals to the windows in stack and Flemish brickwork, under a plain tiled roof, relieved by a full height stair window detailed with projecting HW fins. An array of PV solar panels is concealed above the roof to the café and lecture theatre.